Campagnolo has been on my restaurant bucket list for years, after various sources speak so positively about their meals. After failed attempts, a Toronto staycation was what finally made it happen - an experience I suggest every Torontonian try once in their life. Not wanting to deal with the stress of a scheduled vacation, my husband and I decided to stay in town and do day trips around and outside the city, followed by dinner and drinks at one of our city’s many establishments to end the evening. With tons to see, do, and eat, narrowing down our choices wasn’t easy – even with all our local knowledge. Boy am I glad that Campagnolo made the list! The dinner was as delicious as touted and will definitely have me returning. 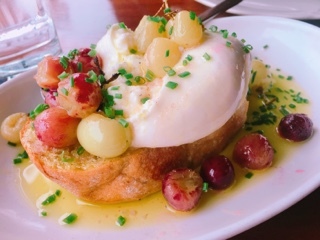 Their fresh burrata cheese ($16) is out of this world; the creamy oozing sphere perched on a thick slice of well-toasted bread sitting in a pool of olive oil. 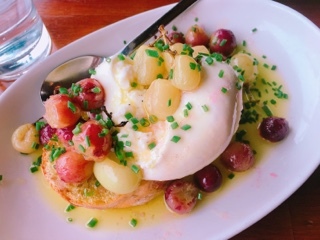 Although looking seemingly simple, there are so many tastes with each ingredient – the silky milky cheese, a peppery kick of olive oil, or the sweetness of the roasted grapes. Then when everything’s combined the magic happens... the flavours pool together and the creamy cheese against the oily crunchy bread with pops of soft grape is just an incredible combination. 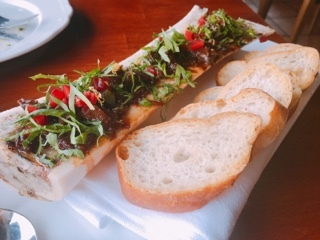 Not realizing how indulgent the burrata would be, we also ordered the roasted bone marrow ($15), which was fully done throughout so the blubbery marrow simply melts onto the crusty crostini. It’s further enhanced with ox tail to give each bite a lovely meatiness and pickled plum pieces that cut through some of the fat. 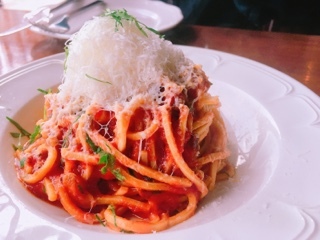 Campagnolo takes the humble spaghetti ($19), a dish that’s been replicated across households for decades, to another level. Their fresh pasta is a slightly thicker chewy egg noodle, which although soft still manages to have an al dante bite. The sauce is rich in guanciale (cured pork cheek), garlic, and onion, to tame any acidity from the tomatoes. It’s rich and satisfying and with a healthy mound of cheese combines to become gooey heaven. 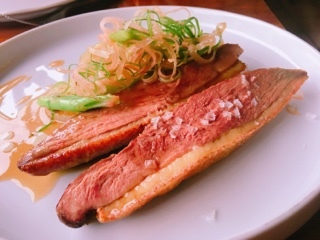 Despite looking overcooked, the duck breast ($29) was tender incorporating a small sliver of crispy rendered skin. Likely, the fowl was darker than normal as it’s been dry aged really deepening the duck’s flavours and augmenting the gaminess of the meat. The stronger taste is balanced with a kohlrabi slaw, grilled green onions, and a silky rhubarb sauce. Other than the burrata, Campagnolo’s portions aren’t large, but with the rich ingredients each dish can be split and still leave you satisfied. To end, their large slice of olive oil cake ($12) is great for sharing. The traditional white cake is infused with a golden olive oil and a hint of lemon. 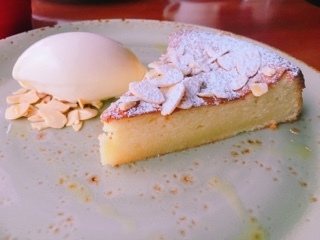 On its own, the dessert is rather neutral and good for those who don’t like sugary items, but it’s even better with the sweetened buttermilk sorbet and crunchy almond slivers. 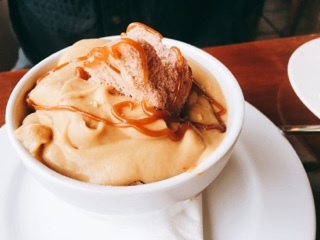 Having heard friends rave about the salted caramel budino ($10), I coerced my husband into ordering it, knowing sweet and salty puddings weren’t something I’d want more than a few spoons of. By itself, the pudding was rich but plain, it really needed the crunchy pieces of chocolate meringue incorporated into the dessert. I suggest you try some on the olive oil cake - the sweet and salty caramel flavours deepen with the pastry and adds an almost espresso taste to the cake. Campagnolo’s friendly service makes you feel warm and welcomed; they’re careful to ensure you’re not disappointed. For example, when I ordered to Vacanza fizz ($8) cocktail to start, Jeff warned us that it’s non-alcoholic, confusing since it’s at the bottom of the list. Nonetheless, to pacify my desire for a cocktail, he noted they could easily add vodka (additional $7) to it. The first sips of the watermelon juice drink was refreshing, especially with the lime and mint infused into it. I love fizzes for the frothy egg white foam on top (it adds a creamy smoothness to the drink), which is what the first sips were like. 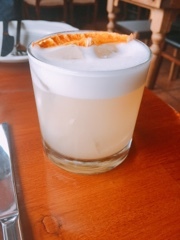 However, after letting the Vacanza fizz settle for a few moments, the egg’s aroma starts seeping through … although still drinkable, the smell of egg is the last thing you want when sipping a refreshing drink. Although Campagnolo’s food is fantastic, their drinks are where my experience falters. Aside from the eggy smelling foam on the cocktail, my Chianti had so much sediment in it that I couldn’t finish the last third of the glass (although my husband also ordered it and his was fine). Of course, I could have “returned” the wine, but haven’t had most of it and the meal almost over, I felt bad. Luckily, their food is so good that these minor slips can be overlooked. Campagnolo is a restaurant I’ll return to when I want an indulgent rich meal. Thanks to the Toronto staycation, I’ve finally learned where the best burrata in the city awaits.